Who Should Pay For County Dispatcher Salaries? 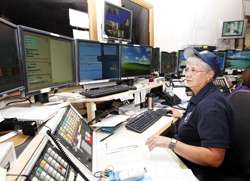 Dispatch supervisor Delores Chapman runs the phone lines at the old Blaine County Sheriff's office in downtown Hailey. On Tuesday, Nov. 4, Blaine County voters will decide whether to increase their property taxes to fund dispatcher salaries at the county's new consolidated dispatch center, which is located in the same building as the new jail in south Hailey. For now, the county-run consolidated dispatch service continues to be run out of the old sheriff's office in downtown Hailey. Does Cove Springs have new life?